Tom Barrasso, who led the Pittsburgh Penguins to back-to-back Stanley Cup titles, is the only goaltender to ever play in the National Hockey League that came directly from high school. Barrasso also won a Calder Memorial Trophy winner and was inducted into the USA Hockey Hall of Fame. Inside the rear neck is the CCM Maska manufacturer’s tag with the player number “35” handwritten on it in black marker. Adjacent is a flag tag reading the size “56”. Diagonally down the front reads “PITTSBURGH” in yellow on black on white tackle twill. The player number “35” is on both sleeves and on the back. 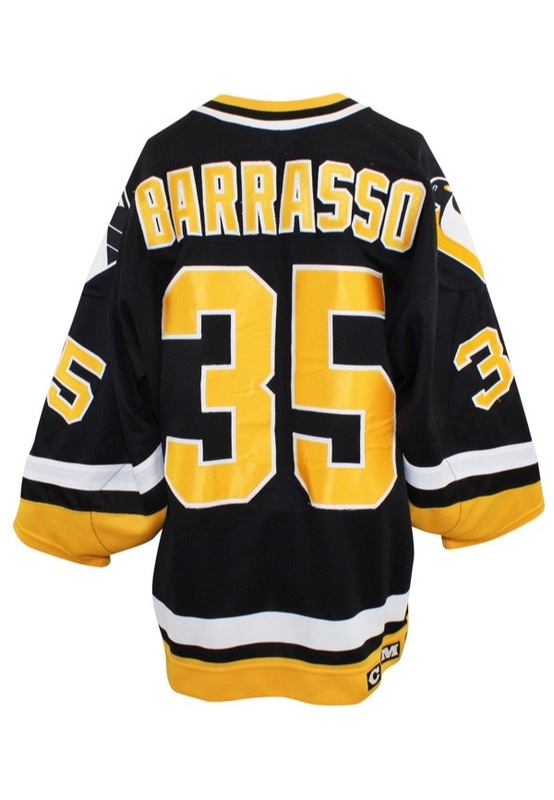 Across the back on a black nameplate is the player name “BARRASSO”. These are done in yellow on white tackle twill. 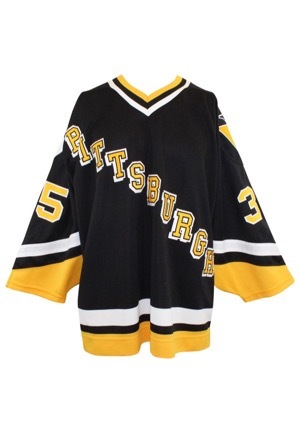 Above the player numbers on the sleeves is a Penguins team logo patch. 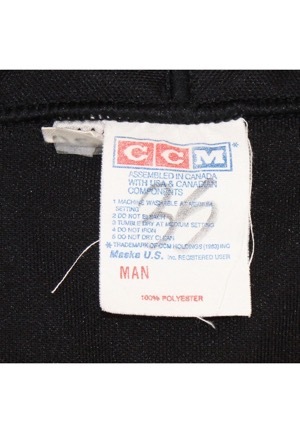 On the outer rear right tail is the official “CCM” and “NHL” logos embroidered. This jersey is properly tagged, was presented to us as game-used and in our opinion, shows appropriate use.